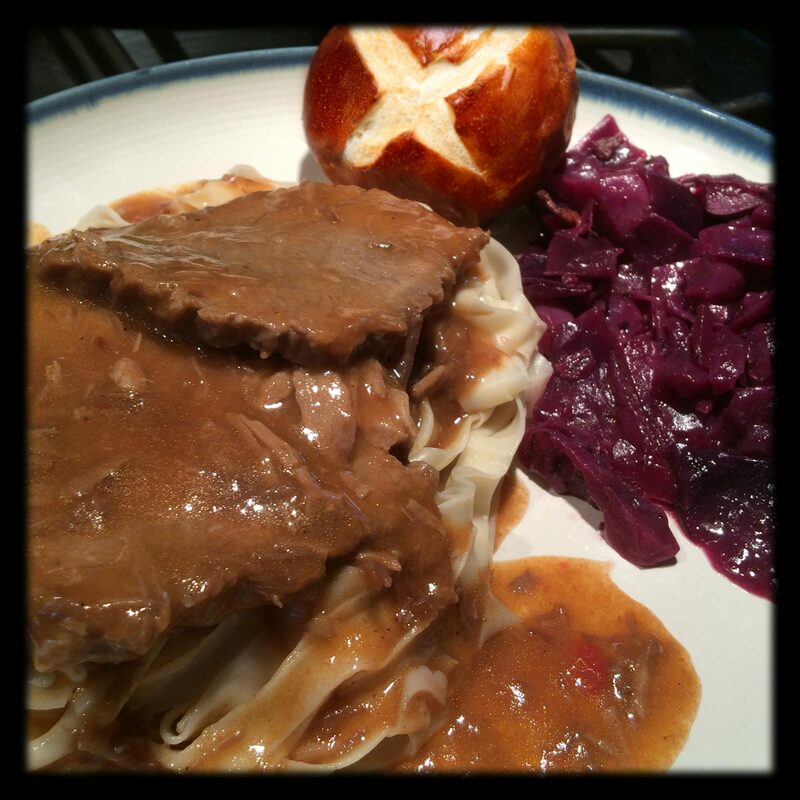 It’s a traditional German recipe of sliced beef in a savory sweet/sour gravy, served over noodles. Pictured above with a side of red cabbage and a pretzel roll. This is a recipe that was handed down from my great grandmother on my dad’s side. My family has been making this every year for Christmas dinner since as far back as I can remember. When I got married, I brought the tradition with me. I’m not sure how far back the recipe goes beyond my great grandmother, but she was a German immigrant, so I’m sure that the roots of this recipe are authentic. The recipe in its current form may be Americanized somewhat from its origin, but it’s delicious. The recipe is a little flexible — especially as it was transcribed, out of order, by my father. But, I stick pretty close to what’s written, making little tweaks along the way as needed. I will included notes at the end of the recipe with my suggestions. In a large pot (large enough to submerge meat) add the vinegar, pickling spices, ginger snaps and enough water to cover the meat. Heat and stir to dissolve gingersnaps then carefully add the meat. Add more water if needed so meat is submerged. Cover the pot and refrigerate for 3 full days. We make this in the winter, so we put it on the porch. Turn the meat occasionally. After 3 days, add the tomatoes, onion, sugar, salt & pepper. Heat to boiling then cover and reduce heat to simmer. Cook for 3 hours, or until meat is tender. Remove meat and let stand while you prepare the gravy. Strain the broth through a sieve onto another pot (large enough to hold the gravy and meat). Use a spoon to press some of the solids (onion, tomato) through the sieve. This will help add body and flavor to the gravy. Thicken the gravy using whatever method you like (flour/water, corn starch/water). Slice the meat across the grain into 1/4″ slices and add back to the gravy. Add all of the little chunks of meat that fall off when slicing too! Let that stand on a warm burner while you put everything else on the table, to give the flavors a little time to infuse the sliced meat. Roast: We’ve used bottom round roast and rolled roast. Anything that makes a good pot roast will work well. Tomatoes: My father’s transcription of this recipe (which is the only “original” I have), doesn’t mention what size can of tomatoes to use. For a 3-4 pound roast, I usually use a 14.5oz can of stewed tomatoes AND an 8oz. can of tomato sauce. Ginger Snaps: I use boxed, name brand ginger snaps. Some recipes say to crush them. I add them whole. They dissolve pretty quickly. The recipe says 15, I usually use more for a large pot of marinade, 20 – 25. Boxed ginger snaps are smaller than what my great grandmother probably used. She probably made them herself. Sugar: I use plain white table sugar, and a little less than what’s called for. (I haven’t tried brown sugar, but I bet it would be even better. Next time!) Add less to start. Taste. Add more if needed. There should be a good balance between the sugar and tartness of the the ginger snaps and vinegar.